After several years of litigation, the decision on how to manage domestic sheep on the Payette National Forest to maintain viability of bighorn sheep populations will be released on July 30. Several options were considered but few actually meet the so called “purpose and need” of the decision. Regardless of the decision, litigation will likely follow as there is a lot at stake. Bighorn sheep, which have struggled with disease outbreaks caused by contact with domestic sheep, in Hells Canyon and the Salmon River Canyon will be affected by the decision. There are estimated to be approximately 1,000 California Bighorn Sheep and 1,800 Rocky Mountain Bighorn Sheep in Idaho and only 700 of those are native Rocky Mountain Bighorn Sheep which live in central Idaho. This is approximately half of the population that existed in the late 90’s and trends indicate further declines. Of greatest concern to the bighorn populations in Idaho is contact with domestic sheep and the fatal diseases which they carry. The limiting factor in the populations continues to be pneumonia and not weather, habitat, or predation. 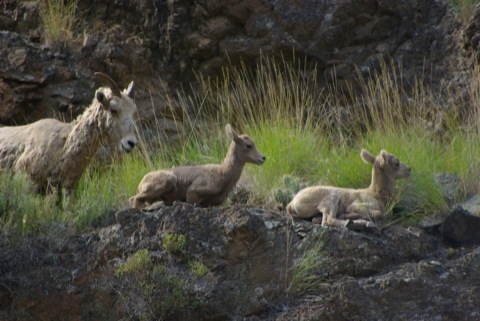 If the adult bighorn sheep are not dying outright from disease through contact with domestic sheep then their lambs are dying within weeks of being born thus, the bighorn are not replacing themselves at a rate fast enough to keep up with other mortality factors and are continuing to decline in population. For years after an outbreak lamb survival is the limiting factor. My name is Mike Bullard. I am running for Idaho Legislative seat A, district 4., Coeur d’Alene. I am a retired minister, making my first foray into the political realm. I love the outdoors, mostly hiking and fishing, have some family history in fish and wildlife, and have planted a few trees and kept a couple of ponds and aquariums. So I am interested in scientific issues about our outdoors, though I am very new with the political sides of things. In particular, I was attracted to your work because of the 2009 Idaho Senate Bill S1232 and issues involving bighorn sheep v. domestic sheep and associated disease. Most of what I know about sheep has to do with stories from the Bible, so I am your student. Frankly, I’m pretty sure that between the hunters,hunting industry, and the environmentalists in our area, sympathies here would be stronger for BHS than for domestic sheep interests. So I am wanting to be taught about the issue. With all the work of campaigning, I don’t have time to do a lot of research, but I do like to look at numbers and facts, so I would very much appreciate hearing from you.